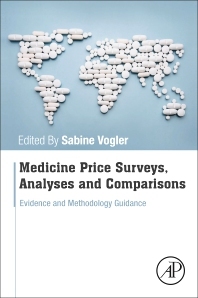 Medicine Price Surveys, Analyses and Comparisons establishes guidelines for the study and implementation of pharmaceutical price surveys, analyses, and comparisons. Its contributors evaluate price survey literature, discuss the accessibility and reliability of data sources, and provide a checklist and training kit on conducting price surveys, analyses, and comparisons. Their investigations survey price studies while accounting for the effects of methodologies and explaining regional differences in medicine prices. They also consider policy objectives such as affordable access to medicines and cost-containment as well as options for improving the effectiveness of policies. Sabine Vogler is Head of the Pharmacoeconomics Department at the Austrian Public Health Institute, and Head of the WHO Collaborating Centre for Pharmaceutical Pricing and Reimbursement Policies affiliated to the Pharmacoeconomics Department. As a senior researcher working in this area for more than two decades, she has expertise and in-depth knowledge about European countries with regard to pharmaceutical pricing/prices, reimbursement and distribution, as well as cost-containment reforms, access and affordability issues. The Pharmacoeconomics department runs the Pharma Price Information (PPI) service that provides medicine price information for 30 European countries, and Dr Vogler and her team use PPI to support public pricing authorities as well as for research purposes.